Stephen King, I write like him! A WIP of him! I can honestly say that if your blog contains anything about Stephen King, I will read it and most likely reblog it. 🙂 This fit the bill perfectly and the energy on your blog is so loud and inviting anyway! Now I’m off to get analyzed. 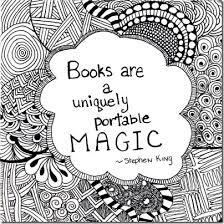 Absolutely agree with Stephen King’s quote. Books have this amazing quality about them, they transport us into another world, a world in which anything is possible. Well with this in mind, let me tell you about a bit of fun I had yesterday, I posted the first few lines of my novel in this website: http://iwl.me/ I write Like. My writing was analysed. I have to say I was astonished when the website matched me to Stephen King. One, I don’t write horror! There are scary bits in my book, and parts of it have frightened me. Though I am easily scared by my own writing. I have too vivid an imagination not to be! This is a bit of a hazard. Two, Stephen King is a legend, and I’m just well a bit of a work in progress, yes a WIP. It’s a fun tool! 🙂 Enjoy!